This 3″ cdr contains one untitled track that lets you inhale the smog and rust of Zaporizhia, Ukraine. The cover of the first 15 copies is a fullcolour print with blockprinted logo stenciled on the front panel. On the second edition the logo is stenciled with spraypaint. 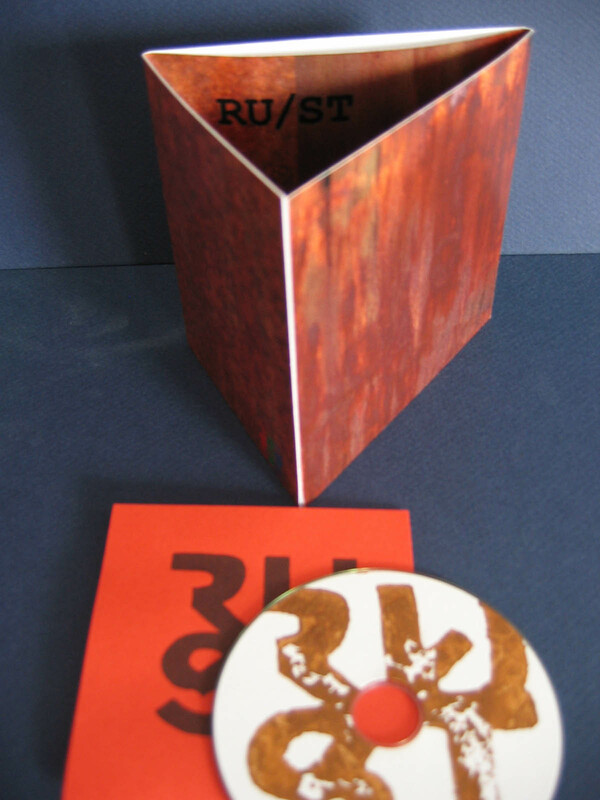 RU/ST is a noise project from Zaporozhie, Ukraine. Because of the new untitled release of RU/ST on resdatcom; we decided to do a short interview to get across some ideas behind the project and the sounds involved. S- You told me RU/ST is a manifestation of both your surroundings; a city of rusted and broken factories and your thoughts and feelings; ‘ life in ruins and ruins in your head and heart’. Would you say that the way you think about your surroundings influences the way you feel, or would you say it is the other way around? V: I practically live here my whole life, the city is famous for two things: the Cossack Sich and plants, which are just countless here. When every day you see the empty eye socket factories, ragged veins rusty pipes, inhale the smoke every day, all over, the world here is in rusty-gray colors. RU/ST – the voice of a dying city, which is in agony, until it’s line is flat. Apocalypse came here a long time ago, many peeps did not notice this. Yes, I feel no visible presence of the rusty monster of concrete and glass, he whispers to me, how the track should sound. It is based on radio noise, I think this reflects the essence best. S- The sounds on the untitled track bring to my mind both the (irregular) structure of rusted surfaces and the process of corrosion itself. One of the sounds you use is radio noise; is there any particular reason for you to use radio as an instrument or sound-source? V: I like how a detuned radio sounds, some peeps say they have heard voices of dead peeps in white noise. I hear the pulse of the city. It’s the best instrument for making something abrasive and heavy. S- I was looking at the artwork on your Bandcamp-page; Do you do the artwork yourself? (some are credited Xthon, some not credited) Could you tell me more about it? V: I started making design in 2007 or 2008 as an amateur, first trying to make artwork for local bands and projects, now I’m the owner of HMF Graphics, I make all digital work (uncredited works on my BC page are mine). Now in HMF Graphics I have two painters; Xthon, whose work I had used for releases and Deathless – her work has not been used before, but we work on new tape cover and CD. Now HMF Graphics can make all types of graphic works, like covers, shirts, logos, etc.